What? It's only Wednesday? Don't talk to me, hoomin! NOTES: Zippy is one of the most adorable bunnies ever!! He has such a unique face and an awesome personality to match. 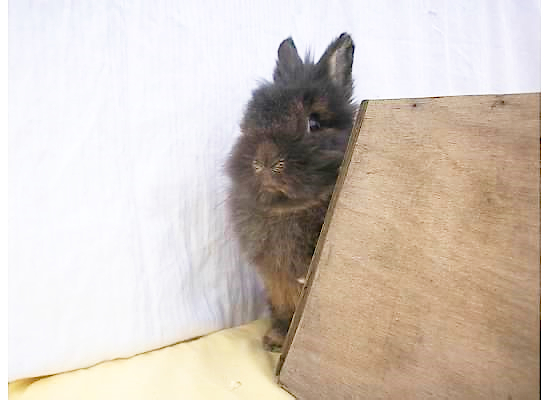 Zippy struggles with chronic respiratory issues so we will adopt him out as a special needs bun to a rabbit-savvy family. Zippy has a great sense of humor and actually would prefer it if we didn’t know he loves all of the attention we shower on him…but we know he loves every bit of it. We also think Zip would make a great husbun to some lucky lady. Zippy is one-of-a-kind and we adore him! Up and at 'em Zipster ... it's a long way to the weekend and there is massive disapproval needed! Zippy, is this truly disapproval of Wednesday, or perhaps of shortened weeks at the tar pits wherein hoomins get all confused about what day it is? ?